Signboards are mostly used to display a company’s logo or products. Compared to billboards, signboards are smaller in size and vary in designs. Billboards have a vertical rectangular shape while signboards have a more artistic photo shape depending on the restaurant’s design. Due to a billboard’s sheer size, they cannot be formed to fit a specific design or shape compared to signboards which are mostly displayed outside an office or establishment’s entrance. Most restaurants also use signboards. They inform new customers they have reached their destination and inform recurring customers that good food is waiting for them inside. Restaurants are the best establishments to use signboards as they can design the signboard to fit their own concept or theme. Signboards are art forms themselves and, sometimes, they can make or break a customer’s decision to eat in a particular restaurant. 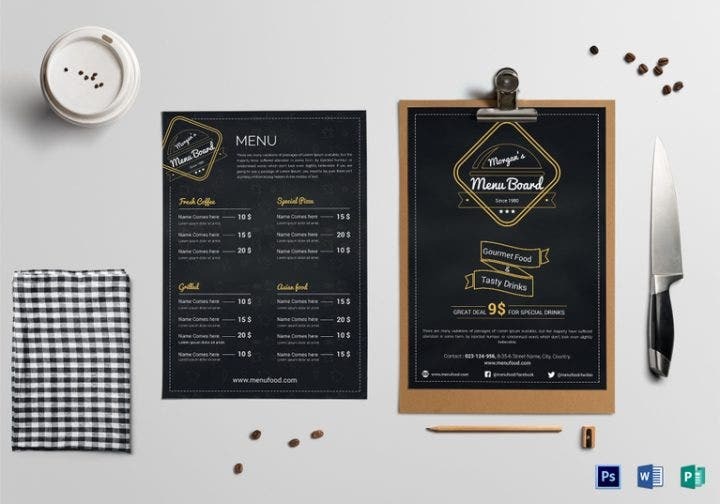 Here are the some of the best restaurant signboard templates to use for your own restaurant or if you are planning to start your own restaurant business soon. How effective are restaurant signboards? Restaurant signboards are very effective in that they provide basic information to the customer (restaurant logo, address, products, etc.) and also assist in a customer’s decision-making when it comes to eating in a particular restaurant or not. The most basic restaurant signboard has the hotel and restaurant’s logo plastered on it. Newer signboards these days have incorporated other information and try to squeeze in more details in the signboard such as the restaurant address and contact numbers. The signboard may become overstuffed at times, but it remains a highly visible tool to attract customers. Additionally, signboard designs can convince customers to eat in your restaurant or not. A terrible signboard will drive customers away and keep customers from coming back. Also, inappropriate signboard designs like ones that have vulgar text and crude images also create a bad image for your restaurant. Customers don’t even need to go inside to convince them they won’t be ordering any food. Large-scale restaurant signboards also provide a picture-worthy moment for customers. A well-designed restaurant signboard design with highly detailed art being incorporated in the signboard adds to the aesthetic appeal of the restaurant. Customers will surely take notice and take pictures with the signboards together with the restaurant exterior. All in all, signboards add to the total customer service experience. 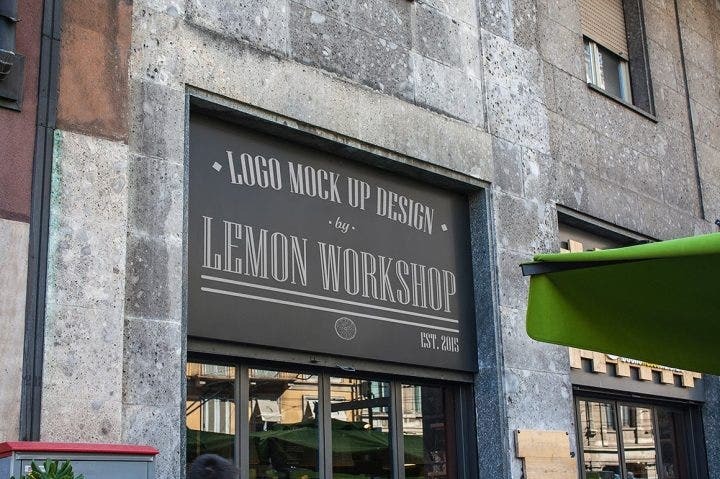 Use this amazing wooden signboard template for your own restaurant. Edit the text to spell out your restaurant’s name and you can also add the logo in the side or center of the template. This template is best used for restaurants mostly selling grilled food as well as hamburger or hot dog joints. 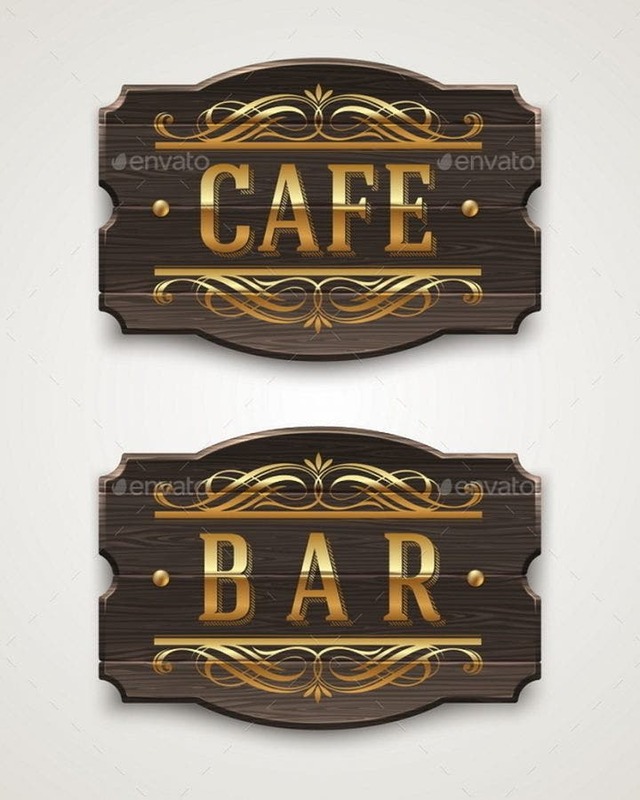 This wooden signboard template set is perfect for different uses in your restaurant. 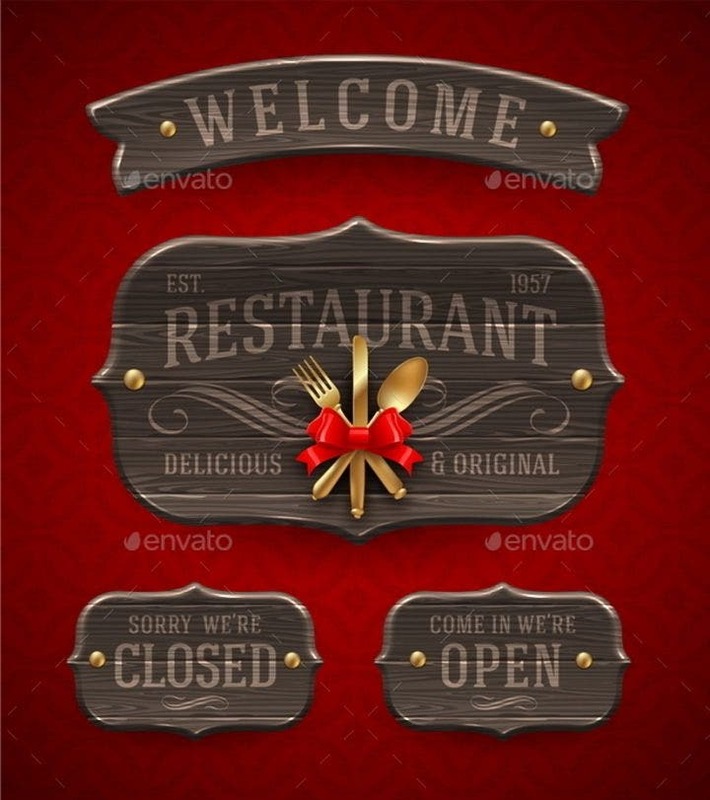 Aside from the template where you incorporate the restaurant’s name and logo, three other templates are available: “welcome”, “open” and “closed” signboards. Use them accordingly in your restaurant. This wooden template has a similar design to the previous two templates, but it is specially made for an Italian restaurant. 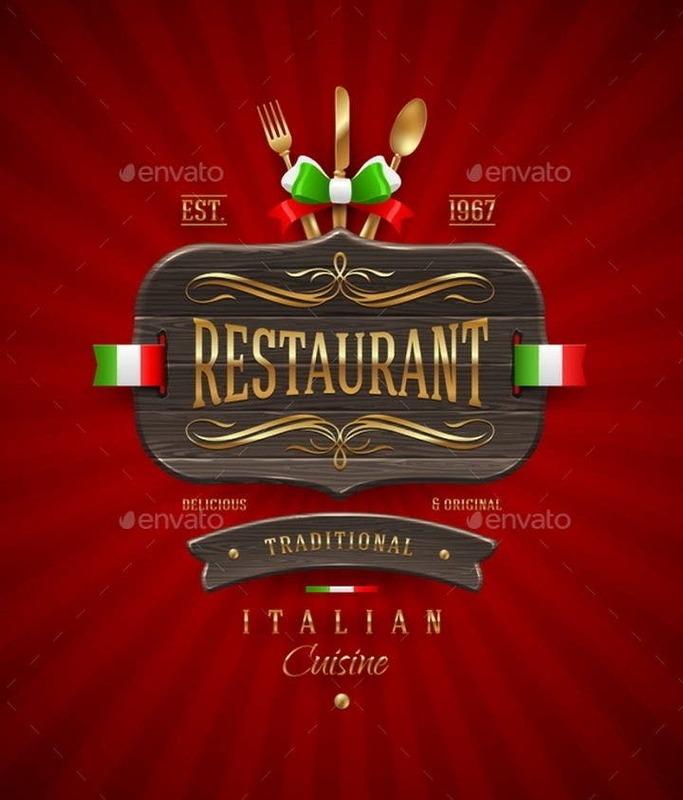 If you are serving Italian favorites like pizza, lasagna, carbonara, ravioli, risotto, and tiramisu, then don’t hesitate to use this attractive signboard template. 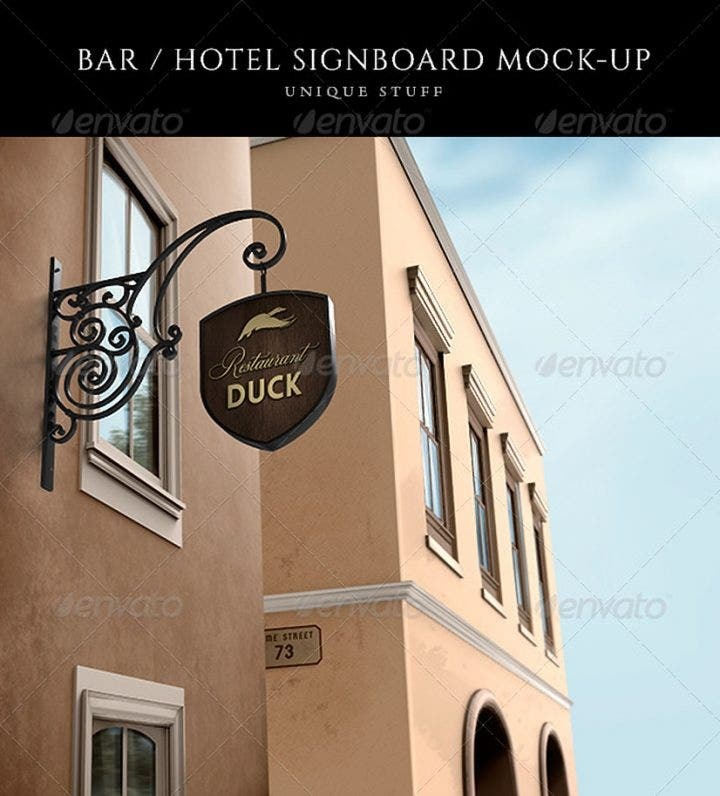 This wine bar or restaurant signboard mock-up is something you don’t want to pass up. Use this template if you are selling some exquisite European dishes. Additionally, as the name of the template suggests, this signboard template is great for wine bars. 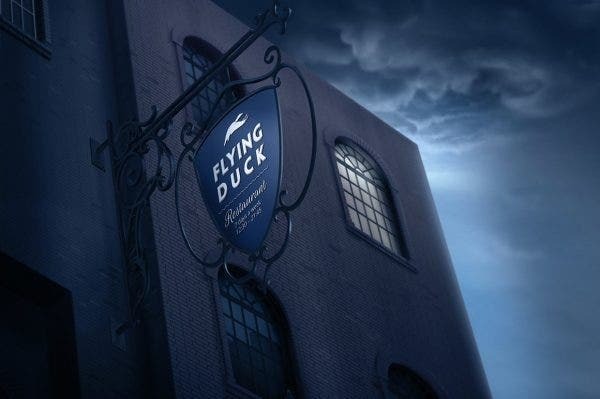 This signboard mock-up with dark blue hues is ideal for pubs and bars, but it can be used for restaurants as well. The design resembles a signboard for a meat shop or seafood restaurant, so use this if you are serving up some fine pork, beef, and fresh seafood. 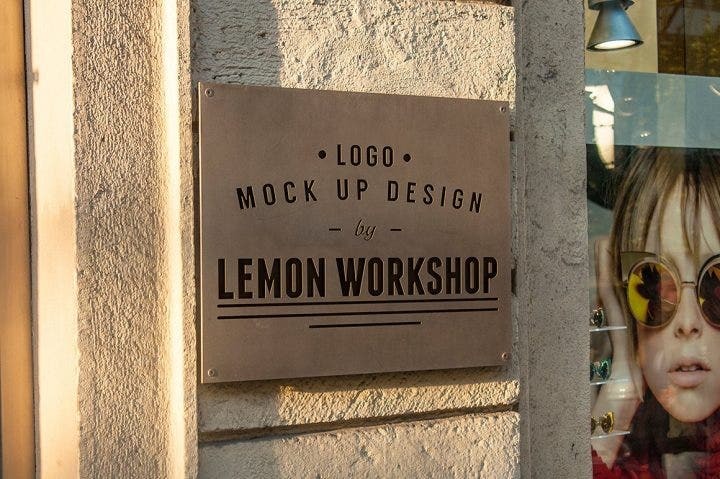 This signboard mock-up resembles a chalkboard designed signboard. Similar to the signboard template above, this template is best used by restaurants specializing in meat dishes that are grilled, broiled, and fried. This blank signboard is very versatile and can be used for any food business. Insert your restaurant’s logo in the blank space provided in the template. This 3D signboard mock-up with templates is perfect for digital signboards to make them look more futuristic and visually appealing. If you happen to have a digital signboard at the exterior of your restaurant, purchase this signboard now. 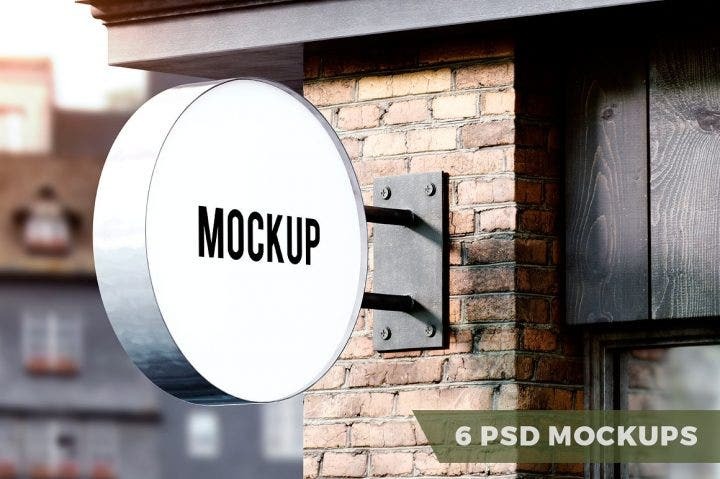 This signboard mock-up lets you choose from six beautiful signboard designs. 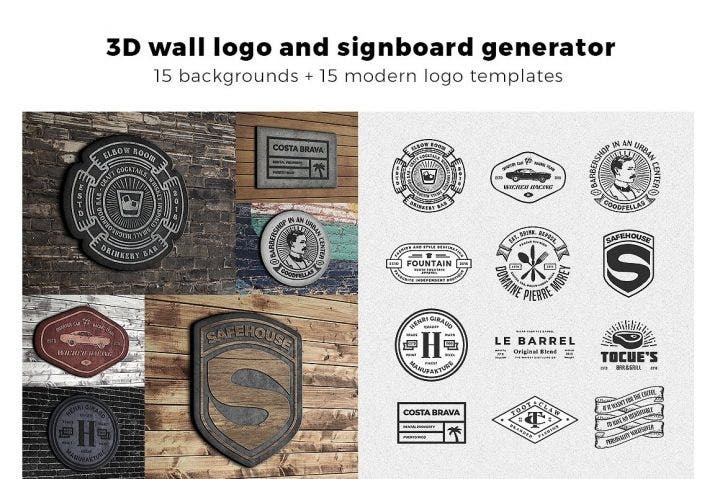 If you have extra funds, you can change the design of your restaurant signboard from the designs found in this template set. 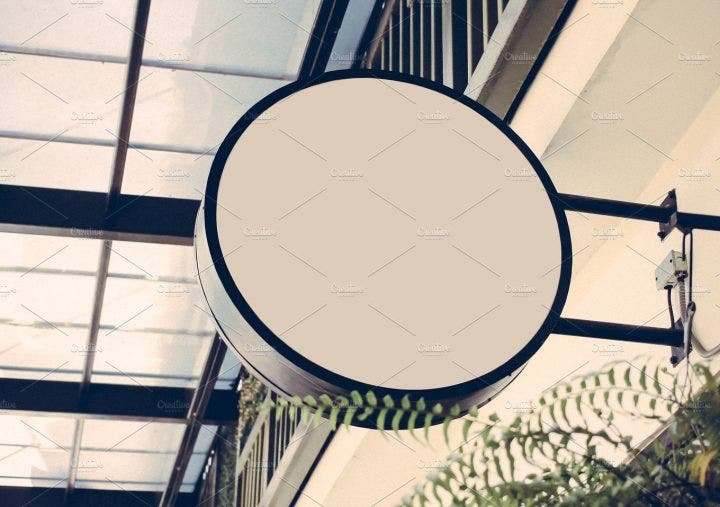 This logo mock-up wall design is ideal if you want to have a signboard mounted to your restaurant entrance so that customers can easily spot your restaurant menu. Create your own restaurant signboard using this billboard mock-up and add the restaurant’s logo and some signature dishes for added visual appeal. The last thing you want to have is a template you just purchased but you can’t even add your own designs (especially the restaurant logo). Although most templates can be edited, there are a few which are only available for direct printing. Before you click the “pay now” button, make sure all the aspects you want to incorporate into the signboard template can be accomplished. Also, contact the designer selling the template ahead of time and have constant communication with him or her so that editing the template will be made easy on your part. Since signboards are part of the restaurant’s marketing campaign, it is advised that templates should be colorful enough to attract both customers and passersby alike. There are some templates where you can edit the text but not the color, so choose templates which have pre-designed color schemes and pick the best one for your own restaurant. A colorful signboard has more visual appeal than ones with plain or monochromatic colors. Using color combinations adds another layer to any design (especially signboards), and will definitely bring life and added attraction to your design. Most of the time, restaurants use signboards to advertise the vintage restaurant’s logo. It is true for the most part that most restaurant signboards have their logos printed on them. Signboards are some of the best forms of marketing and incorporating your restaurant logo in signboards gives you the best chances of increasing sales in the restaurant. Since you will be using restaurant logos in the signboards, make sure your logo is appealing and attractive. The best thing about third-party designers is that they are available when you need them most. Designers are found all over the web, so you just have to invest some time in searching for them. If you have any concerns or get confused on how to accomplish the designs you purchased from the design shop, third-party designers are just one direct message away. Graphic design forums and groups can also offer a helping hand to newbie designers. Increase visibility among your customers and let them be amazed by your stunning restaurant signboard templates. Signboards are very effective marketing tools, so don’t think twice about using them for your own restaurant.